A bag for convenient transport and fits into a trunk easily. Lightweight and convenient, easy to remove and put in storage, no tool needed. 10 x 10 canopy with walls, featuring a steel full-truss frame design, corrosion resistance and good rust resistance, combines the light weight and durable, it can be set up in minutes by one or two people without any tools. 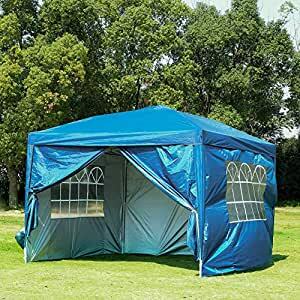 10 x 10 canopy sidewalls attach with Velcro fasteners for easily assembly or removal, give you a quick private space. The 10 x 10 pop up canopy tent keeps the rain in bad weather and the sun off in good, is ideal for all your outdoor commercial events and recreational usage (small business, craft shows, tailgate parties, picnics, camping, party, BBQ, camping, vendors, flea market, outdoor sporting events).